Even though well over a $100,000 worth of goods were sold last weekend, there are still 14 rooms filled with outstanding donated and new items â all half price. 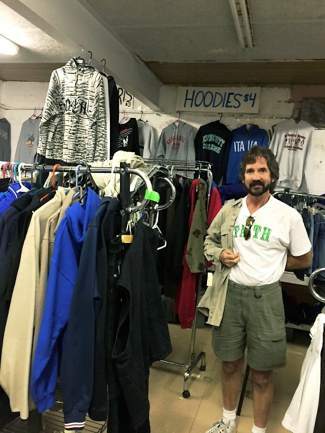 Paul Grewe, of Eagle, shopped on Sunday and found lots of great clothing. Doors will be open from 8 a.m. to 5 p.m. Saturday for the half price weekend of the Eagle Valley Community Fund Rummage Sale at Maloit Park. Lunch is available for purchase. Sundayâs hours are 8 a.m. to 3 p.m. For more information call 970-827-9426 or 970476-5701 or visit www.eaglevalleyrummagesale.com.